Discussion in 'Bonus Spins - Extra Spins - No Deposit Bonuses' started by Marina, Jan 30, 2019. Click here or on the image below to see if you are eligible for the 2019 Loyalty Rewards Offer from CasinoRewards. 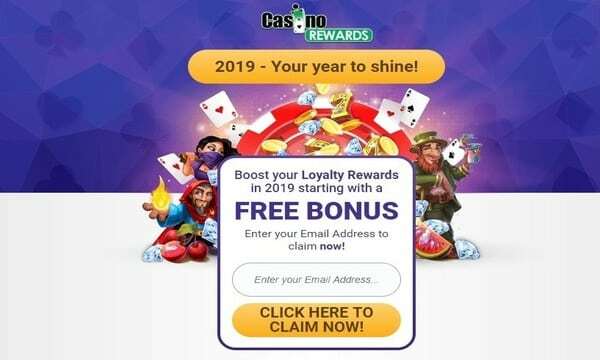 Casinorewards has again a nice promotion for loyal players - 2019 Your year to shine! Please note: This is NOT for all players. ONLY for selected players who received the letter from Casinorewards. Some existing players did already receive a letter from Casinorewards with information on how to claim a free bonus and more offers. You may try if you are eligible on this site www.casinorewards.com/your2019 . Once on the site, enter the email you used to sign up at Casinorewards brands! I got a nice €50 no deposit bonus + 50% match bonus up to €300 on my next deposit. Bonuses will be added as points and you can redeem them in your Casino Lobby - Promotions. because many are doing a search for the url instead entering the url in their browser and go directly to the site. We hope many will get this nice offer! Good luck everyone! I got a €30 bonus for free and a 50% match bonus up to €300! Dobri den mne tiez dosli obalky dokonca aj 2 ale ten link nefunguje prislo mi jedno vcera a jedno predvcerom ako je to mozne ze nefunguje za Vasu odpoved vopred dakujem. Good day even me packets even 2 but this link does not work for me one night and one precursor as it may possibly does not work behind your reply thank you in advance. Welcome Slavomira. I just tried the link and it still works for me. Maybe try it again using another browser? ... Casino Rewards - 2019 - Your year to shine! If you got the mail from Casinorewards, it should work for you. It is for selected players. I am sorry @Slavomira, but I really cannot understand your above post. When I try to translate it via Google to english, it makes no sense what I read. Can you please try to explain in english? Also, if you are not able to claim this bonus from Casinorewards although you still got the mail from them, you should contact the casino support. Maybe they can help you. WE ARE NOT Casinorewards, please contact the casino support for this matter.